Just Listed! More photos available soon! New to market rare find 61’ Garlington. 3/3 layout with 10V 2000 MTU power pushing her to a 35kt cruise and 45kt top end speed. 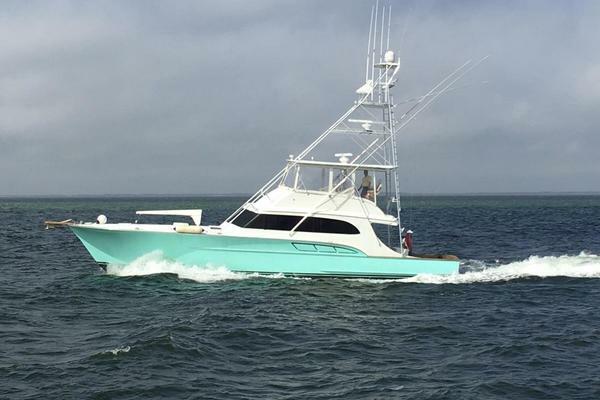 (2) Northern Lights 20kw gens, many upgrades in the last year including new teak deck, mezzanine, Garmin electronics with (2) 8617 displays, chirp sounder, 72 mile radar. Additional equipment includes water maker, Eskimo ice, underwater lights, etc. Too many upgrades to list. Won’t last! All the way forward is the Master Stateroom with an ensuite head, queen berth with storage under, and two nightstands. Across is an entertainment cabinet with a Sharp flat screen TV and a cedar lined hanging locker. Aft to starboard is an over/under washer and dryer in closet. Aft is the Crew Stateroom with upper and lower berths, hanging locker and a Sharp flat screen T. Aft is the crew/day head. Across to port is the Guest Stateroom with twin side by side berths, private head with shower, cedar lined hanging locker and flat screen TV. Up the companionway is galley to port forward with granite top and four Sub-Zero refrigerator drawers beneath. To port are two stainless steel sinks, forward is a 4-burner Kitchen Aid cooktop. Above are cabinets with microwave oven, dish, glass and food storage. Across to starboard is Sub-Zero freezer and Scotsman icemaker. In the cabinets above are satellite radio, Seatel receiver and Sat phone. Aft in the salon, to port is a large L-shaped leather sofa (2014) and teak hi-lo extendable table that can be used to dine. Across to starboard is a Toshiba 42" TV. Clear coat on bright work and more!